Here we are with yet another WhatsApp mod and this is called the OGWhatsApp 2018. This version which we are bringing is the latest OGWhatsApp v6.40 Apk available for download on Android devices. The OG WhatsApp is just like the other whatsapp mods which we have discussed earlier. Like WhatsApp Plus or GBWhatsApp. For ordinary person original and updated WhatsApp is quite enough to fulfill their messaging needs. But if you are a tech geek or you want to have any app loaded with most possible features, or you are into all those modded applications, then this OGWhatsApp Official-Plus Apk is yet another app to make you feel at home. This is the latest version of OG WhatsApp for 2018 so far. The OGWhatsApp has some common features as compared to the previously discussed whatsapp messaging app mods available online. It also helps you Hide Blue Tick sent messages, Let you download and send any type of file you want, It helps you post multiple status once and much more. Here are the latest OGWhatsApp 2.11.432 Apk features. Step 2: The second step is to rename the /sdcard/WhatsApp directory to /sdcard/OGWhatsApp. You can do this using any file manager for Android, though it is easier to do this from Windows. Step 3: The third and last step is to verify your old number in the OG version of WhatsApp, and then verify your new number in the normal version of WhatsApp. That’s it. OGWhatsApp is a very useful tool for users who want to have two WhatsApp telephone numbers on their Android device. To download the OGWhatsApp make sure to follow these steps. 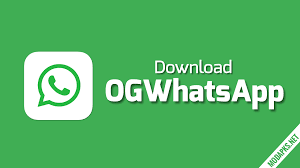 Download the OGWhatsApp apk from the given links below. Make sure to enable the unknown source installation option on your Android phone to install this app. For that Go to Settings> Security> Unknown Sources > Enable. Once this done you can install any third party app on your device. Now install the Apk file. Once done simply register your number and get the backup you just made of all your WhatsApp messages, Chats or Media. You have yet another most powerful WhatsApp messaging app installed on your device. Enjoy! !